As I have mentioned numerous times, I love to go to cooking classes, so when Mary Ellen invited me to participate in one she was teaching, I jumped at the chance. I was advised to bring my chef’s knife and an apron, and of course I took my camera. It is always fun to see how a cooking teacher conducts her class and what tips I can pick up. Plus I get to eat wonderful food and take the recipes home. 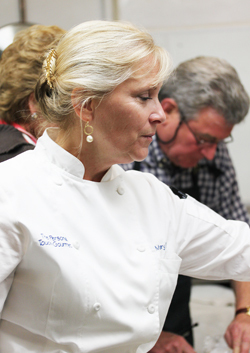 Mary Ellen graduated at the top of her class with high honors from the “Le Cordon Bleu” program of the California School of Culinary Arts in Pasadena. Her culinary internship was at the Los Angeles Times Food Section and test kitchen. After culinary school, Mary Ellen started Personal Touch Gourmet, a boutique catering company specializing in small intimate parties, freelance recipe testing and cooking classes around the South Bay and Los Angeles. In 2007, after four years of commuting downtown, she left the paper and decided it would be great to run her own life again. She teaches private classes in your home, either one-on-one or group parties, a great way to celebrate birthdays, bridal showers or special celebrations. 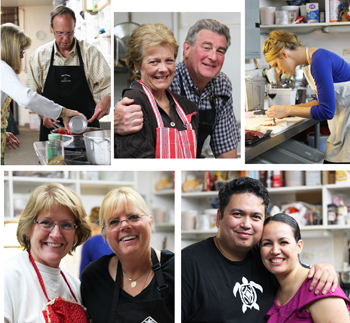 And, of course, the participation cooking classes, such as the one I attended. There were 10 people who came to the class, which included three husband-wife couples. The class took place in a professional catering kitchen, so everything was stainless steel, and every cooking utensil and piece of equipment was available for us to use. Mary Ellen had five recipes for us to prepare, so we paired off in teams of two for each dish. My partner and I got to prepare the Caesar Salad (recipe follows), although I have to admit, she did most of the work, because I was running around photographing everything. And the salad turned out to be just stellar! 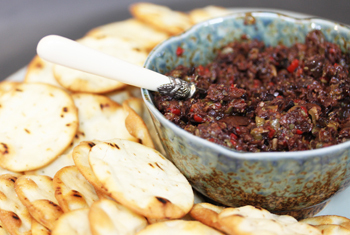 One couple prepared the appetizer, Kalamata Olive and Pequillo Pepper Tapenade, which we ate on water crackers. They were set out on the counter and we just walked by and grabbed a bite as we prepared the other dishes. So tasty! The next dish was the Chicken, Sun-Dried Tomato and Basil Wrapped in Filo. Each person got a chance to wrap one chicken breast themselves. 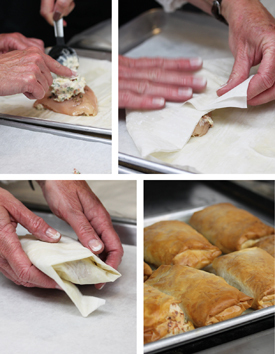 The filo was brushed with butter and the chicken was topped with a mixture of mayonnaise, sun-dried tomatoes, basil, prosciutto, garlic and parmesan, and then the filo was wrapped around to make a neat packet. The resulting dish had chicken that was so moist and tender, it melted in my mouth. I loved this dish. The recipe follows. 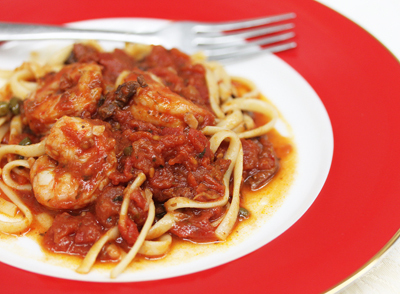 One couple prepared the Linguine with Shrimp and Spanish Chorizo. The sauce had a base of whole tomatoes in puree and tomato paste, with diced Spanish chorizo, capers, Kalamata olives, red wine, garlic, shallots and red pepper flakes. It was simmered for about 30 minutes, with the shrimp being added in the last 5 minutes. As you can guess, we were getting pretty stuffed by this time. But we persevered and truly enjoyed the Chocolate Espresso Brownies. I had to laugh, because when I started to take the photos of the brownies, Mary Ellen rushed over and said, “Let me get that ugly old strainer out of the way!” I had to stop her, because that strainer was the coolest old thing ever that could be used for a food photo prop. Food stylists and photographers go on hunting trips for props like that. Anyway, that strainer had been used to sprinkle powdered sugar over the brownies that we ate. They were fudgy good. Thank you Mary Ellen Rae for inviting me to your cooking class. I had a lot of fun, ate too much and got to take a bunch of photographs of your beautiful food. What could be better! You can contact Mary Ellen at MaryEllen@PersonalTouchGourmet.net or visit her website at www.PersonalTouchGourmet.net to find out all the details of her classes and services. Combine ingredients in a blender or processor, and process until smooth. Season with salt and pepper to taste. Dressing will stay fresh in a covered container in the refrigerator for 3-4 days. Olive oil will harden in refrigerator; remove 30 minutes before serving, whish to incorporate oil. Heat oven to 375 degrees. Place cooling rack on a baking sheet pan. Brush bread slices with Caesar dressing and sprinkle liberally with grated parmesan on top. Bake in oven 8-10 minutes until crispy and golden on the edges. Tear lettuce into bite size pieces, wash and dry. Place in a bowl, drizzle dressing on top and toss to thoroughly combine. Adjust seasoning. Place on a large platter. 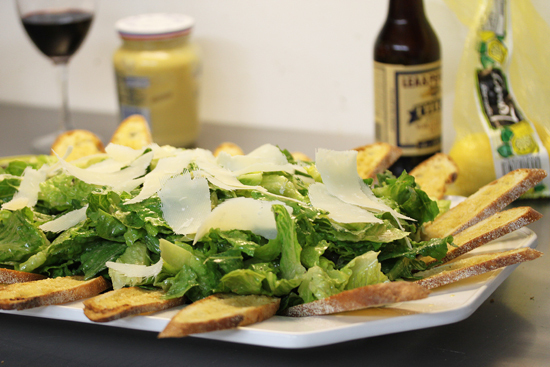 Using a vegetable peeler, shave Parmesan on top of lettuce and serve with garlic bread slices (croutons). Rinse chicken and pat dry. In a small bowl, stir together the mayonnaise, tomatoes, basil, prosciutto, artichoke hearts, garlic and parmesan cheese. Make each packet by laying 1 sheet of filo on work surface and brush with melted butter, (Keep remaining filo covered with plastic wrap and a damp towel over the plastic to prevent drying out). Top buttered filo sheet with another sheet and brush lightly with butter. 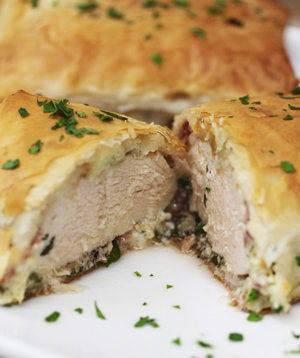 Sprinkle black pepper on one side of chicken and spread 1 ½ tablespoons of mayonnaise mixture on top. Lay chicken coated side down on one corner of filo. Spread top of chicken with 1 ½ tablespoons of mixture. Lift corner of filo over chicken and roll chicken over once. Fold 1 side of filo over chicken and roll again. Fold opposite side of filo over chicken then roll up to use all of the filo. Place packet seam side down and repeat with remaining filo. Brush packets with remaining butter. Sprinkle with freshly ground black pepper and Maldon sea salt. At this point the packets can be frozen in a single layer in an air tight container for up to 1 month. Thaw overnight in the refrigerator, covered, before baking. Bake packets on a foil lined rimmed baking sheet until golden brown on all sides, 20-25 minutes. Hi Lynne, Hope all is well. Have you heard about tastebook.com? A friend’s daughter is getting married and I am putting a cookbook together as part of her wedding gift on this site. I would like to use the photos that you took when you visited my class (caesar salad and brownies) in this cookbook, and I would like your persmission to use them. 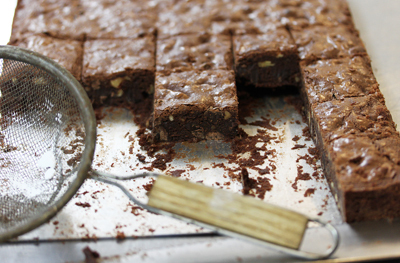 I do love the brownie photo with the old strainer…not sure what I was thinking when I went to grab it away. Please let me know if you approve of my using the photos. Thanks again for the fabulous posting you did of my class!